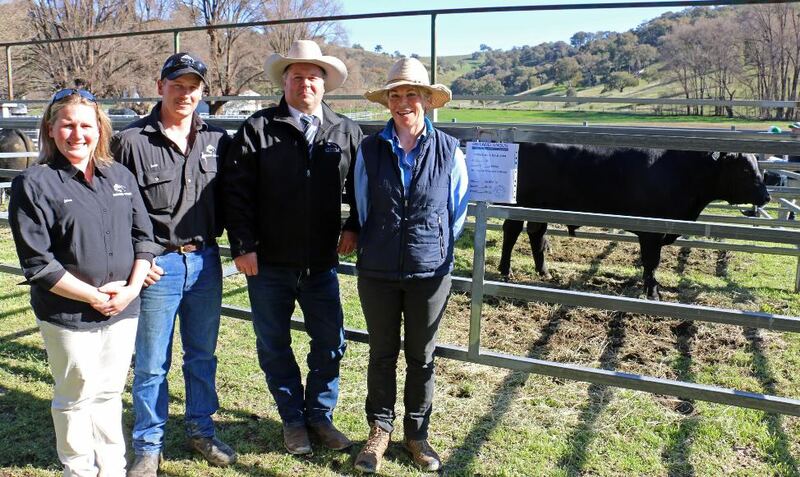 Jess Reynolds and Sam Lucas, Reiland Angus, with auctioneer Michael Glasser, and equal top price buyer Jo-Ann Strong, Tiana Park Pastoral, Jugiong at last week’s Reiland Angus sale. PRICES and clearance rates for spring bull sales so far this year in both northern and southern Australia have generally been solid, despite the widespread drought and reduction in breeding cow numbers across NSW and parts of Queensland. Landmark stud stock agent based at Toowoomba, Colby Eade said there had been mixed results for this season’s sales in his region so far. “Stud and commercial breeders are paying good money for the quality bulls with good data, but clearance rates are down in some sales due to the tough seasonal conditions across large parts of eastern Australia,” he said. “In the north, we are seeing stronger demand from buyers from the Cloncurry, Richmond and Julia Creek areas of Queensland which are having a much better season than they have had for a number of years. Some upcoming benchmark sales in the next couple of weeks including Yarrawonga Santa Gertrudis, Palgrove Charolais and the Ascot Charolais and Angus sale would provide further guidance on how the northern spring bull market was performing, Mr Eade said. Grant Daniel & Long Stud stock agent, Hervey Weyman-Jones said that due to the seasonal conditions, sales this spring were quite variable. “A few sales were better than last year, some were similar, but for others, clearances were down,” Mr Weyman-Jones said. “Buyers have been selective. They are still paying good money for the better quality bulls, but the lesser quality bulls are harder to sell this year,” he said. Santa Gertrudis sales have been particularly solid so far, with good clearances and very good average prices recorded by some breeders. Leading the way was the Dunlop sale at Proston, Qld which averaged an impressive $9217, topping at $26,000 for 84 bulls in a 90 percent clearance recently. Close behind was the Watasanta stud at Tamworth, NSW which sold 32 of 34 Santa bulls for an average of $9200 topping at $18,000 twice. The Moongana sale at Drillham on 1 September averaged $8344 for 48 bulls with an 84pc clearance and a top of $50,000. Buyer of the top priced bull, Eniskillen Pastoral Co, Mantuan Downs, Springsure showed their confidence in the breed and the Moongana sale team taking home five bulls averaging $18,700 from the sale. Also notching up a strong sale was the Cree Santa Gertrudis stud, Thangool, Qld which sold 59 of 67 bulls offered for the healthy average of $8200 and a top price of $26,000. On Friday the high profile Yulgilbar Santa stud near Grafton, NSW sold to a top of $41,000 and an average of $8021. Early Droughtmaster sales this spring have also been solid, although perhaps not yet hitting the highs of the Santa sales. The top Droughtmaster average so far this selling season was the Piggot Aldingar sale at Springsure, Qld which sold 62 of 73 bulls for an average of $5741, topping at $14,000 twice. Close behind was the Valera Vale stud, Augathella, Qld which had a complete clearance of 74 bulls for an average of $5689 and a top of $14,000. The High Country stud, Eskdale, Qld had a good sale which averaged $5566 for 53 bulls with a 91pc clearance and a top of $19,000. Today’s first day’s selling at the national Droughtmaster sale at CQLX, Rockhampton, Qld has set a cracking pace for the breed topping at $55,000 for the Spann family’s Minlacowie Vinnie 8817 (H) to Wajatryn Pastoral Co, Gayndah and averaging $8711 for 248 bulls with a 90pc clearance. Brangus sales have also been very strong so far in 2018, with excellent average prices and high clearance. Leading the way was the Burenda Brangus sale at Roma which had a total clearance of 116 bulls for an average of $9513 selling to a top of $16,500. The multi-vendor Roma Brangus sale on Monday topped at $16,500 for 93 bulls averaging $6817 and the Central Brangus Classic sale at Rockhampton last week topped at $17,000 to average $6411 in a 94 percent clearance. The National Braford sale at Gracemere, Qld topped at $22,000 and achieved a respectable average of $6886 for 132 bulls, while the Ascot-Niemen sale topped at $17,000 and averaged $5455 for 33 bulls. Only two Brahman sales have been held this spring to date, with Bizzy and Jomanda Brahmans at Grafton, NSW selling 28 of 32 bulls for an average of $4864 and a top of $9500. The multi-vendor Woolooga Select Brahman sale averaged $4315 for 54 bulls with a top of $13,500 and a clearance of 85pc. The benchmark sale for the Brahman breed is the massive Brahman Week Sale which will offer 950 Red and Grey Brahmans in the first week of October. Victorian Landmark stud stock agent, Ray Atwell said that spring sales in the south were more than holding their own this year. “While averages were generally back a little on last year’s record prices, clearance rates were still generally pretty good,” Mr Atwell said. Angus spring sales now drawing to a close in NSW and Victoria have generally been solid, with strong averages and good clearances. Standout Angus sale so far was last week’s Millah Murrah sale at Bathurst, NSW which averaged an astounding $15,850 with a 100 percent clearance of 102 bulls. 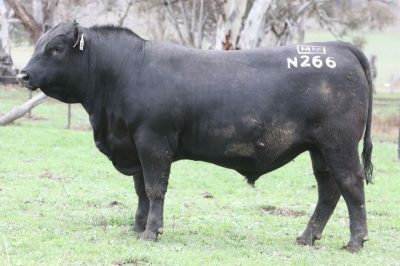 At $54,000, Millah Murrah Nugget N266 (pictured right) topped the sale, setting a new Australian record price for a yearling bull of any breed. The previous mark of $50,000 was set at Millah Murrah last year. The sale average was the second highest in Angus breed history, surpassed only by the $16,348 figure attained in 2016 at Millah Murrah. Bulls sold all over the country with four successful operators out of WA, 14 from Queensland and five buyers from Victoria helping to negate the strong downturn in local bull demand. Another outstanding sale result was achieved by Booramooka Angus, Bingara, NSW in mid August with a complete clearance of 217 bulls for an average of $9036 and a top of $28,000. The Sandon-Glenock sale at Chinchilla, Qld also achieved a compete clearance of 91 bulls in August for an average of $9429 topping at $17,000. Prominent Riverina stud, Rennylea Angus had a very good sale with a complete clearance of 147 bulls topping at $16,000 with a very healthy average of $8812. Reiland Angus sale held last week saw a total clearance of 61 bulls averaging $6041. Principal Mark Lucas conceded he had not expected a full clearance due to the challenging season. “This year, it’s about clearance, not about the actual price. Our top price was down a bit but the average was relevant to where the beef industry is at the moment,” he said.